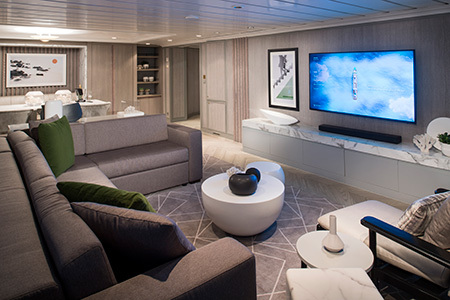 The Penthouse Suite features a separate living area with a Baby Grand Piano, dining table, butler's pantry, private veranda with whirlpool and lounge seating, wet bar, marble master bath with whirlpool tub and separate shower, and separate powder room with shower. 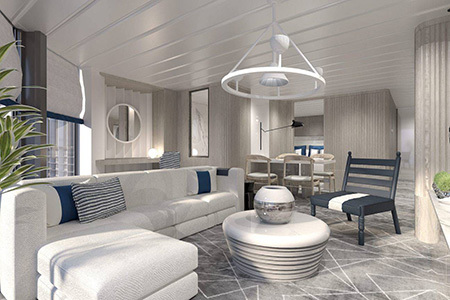 In a Royal Suite you'll enjoy a separate living room and dining area, two entertainment centers, master bath with whirlpool, and a private veranda with whirlpool and luxurious lounge seating. 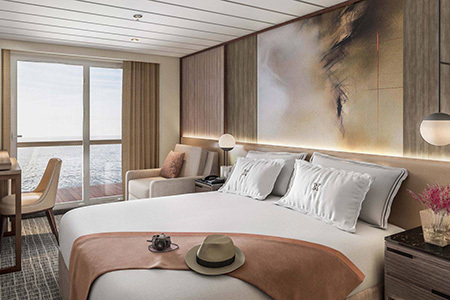 The Celebrity Suite features two lower beds convertible to queen-size, floor-to-ceiling panoramic windows, separate living room with dining and sitting area, two entertainment centers, master bath with whirlpool tub, and private veranda with lounge seating. Connecting door to adjacent suite. 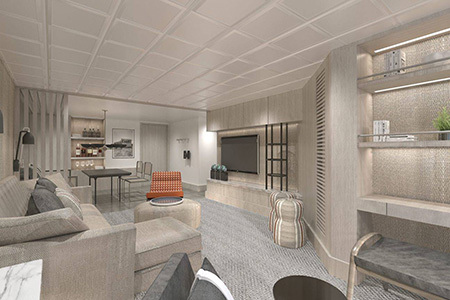 Sky Suites feature floor-to-ceiling sliding-glass doors*, two lower beds convertible to queen-size, sitting area, and private veranda with lounge seating. 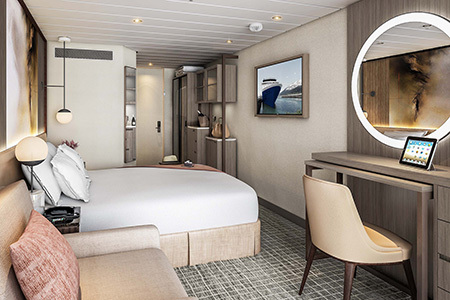 Concierge Class staterooms features two convertible lower beds, floor-to-ceiling glass doors and large sitting area, some with sofa bed. 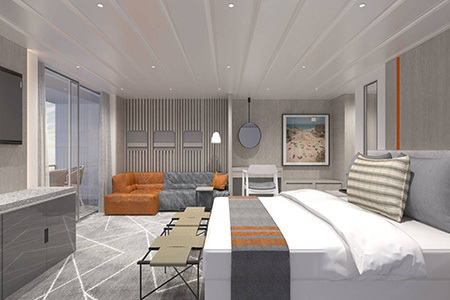 AquaClass suites feature floor-to-ceiling windows, living area with sofa, and a private veranda with lounge seating. You'll enjoy a Personal Spa Concierge, complimentary access to the Persian Garden, and exclusive access to Blu, a specialty restaurant featuring healthful cuisine. Features two convertible lower beds, floor-to-ceiling sliding glass doors, privacy partition, sitting area, some with two sofa beds, and extra large private balcony with lounge seating. Features two convertible lower beds, floor-to-ceiling sliding glass doors and sitting area, some with sofa bed. Features two convertible lower beds, large ocean view window and sitting area, some with sofa bed. Features two convertible lower beds and sitting area, some with sofa bed.